You all know that I love writing about gratitude, and I love writing about Italian. Plus, I’m feeling especially thankful this week (see my previous post). So here’s a little post combining both! I hope you enjoy this first in a series (fingers crossed!) in the category “Weekend Italian.” Blessings! ti ringrazio per tutto quello che hai fatto per me I thank you for all which you have done for me. Grazie per tutti i giorni della gioia, per il divertimento e per gli amici, per lavoro e anche per il gioco; e grazie per l’amiable Tuo cuore che mi protegge, qui, a casa, e dovunque. Thank you for all the joyful days, for fun and for friends, for work and also for play; and thank you for Your amiable heart which protects me, here at home, and everywhere. **Please share any edits or other fun “thank you” phrases in the comments. ❤ Grazie di cuore! 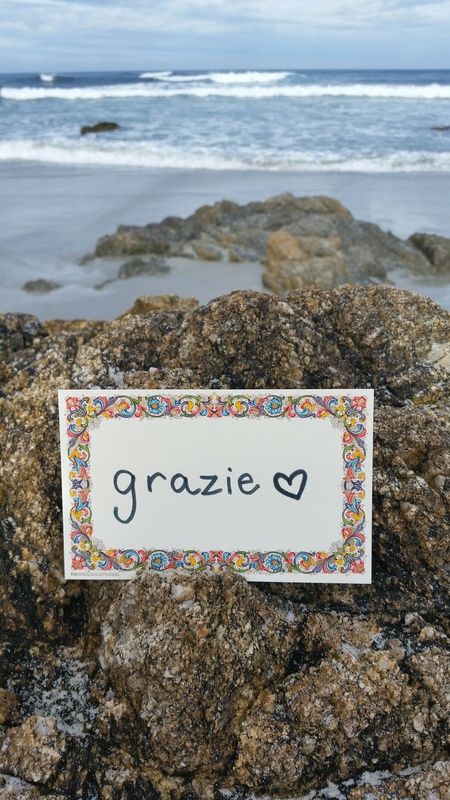 Tags: Ways to say thank you in Italian, weekend italian. Bookmark the permalink. Previous post ← “A Beautiful Ordinary” featured at Mamalode today!